A balance between time spent working and time spent with family is the occupational and employment hot topic of the 21st Century. Endless studies and surveys have been conducted to determine whether Americans care about their work-life balance, how they compare to people who have full-time jobs in other countries, and whether politicians should do something to help Americans achieve a better work-life balance. For Americans who struggle to make ends meet, work may take precedence over family just to support the family. For Americans who are relatively well off financially, the question still stands: are you satisfied with the balance you have between work time and family time? The answer is “Yes’’, according to Spectrem’s Investor Pulse. 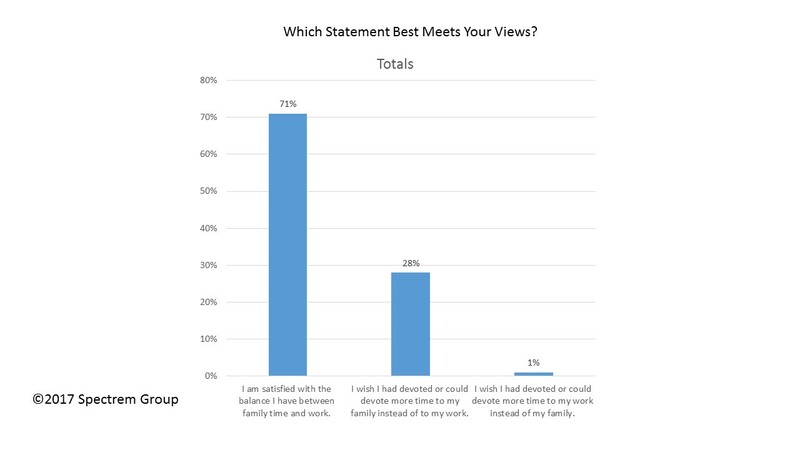 In a survey of more than 1,100 affluent investors, the Investor Pulse found that 71 percent agreed with the question about being satisfied with their work-life balance. On the flip side, 28 percent said they wish they had devoted more time to family and less time to work in their life. The work-life balance can be part of the conversation advisors have with investors regarding their future. Investors may be satisfied now with their work-life balance, but do they plan to change that dichotomy upon retirement? Are they set financially for what is to come when they stop working? Or are they planning to stay actively employed, and how does that decision affect investment plans? Predictably, the responses to the work-life questions differed when investors were segmented based on net worth. Significant wealth provides the opportunity for investors to set their own work-life balance. Of investors with a net worth less than $100,000 (not including their primary residence), only 55 percent said they were satisfied and 43 percent said they wish they had spent more time on family. However, among investors with a net worth of more than $5 million, 84 percent were satisfied with their work-life balance. What is rarely examined in studies related to this topic is a definition of work-life balance. Is 40 hours of work a week the defined satisfactory amount of time devoted to work? Are those people who are not satisfied with their work-life balance working more than 40 hours a week? In terms of other segmentations, investors between the ages of 41-50 reported the least amount of satisfaction with their work-life balance at 63 percent, which is obviously still a majority. Seventy-eight percent of investors over the age of 61 said they were satisfied. One other segmentation showed notable slight differences. Seventy-six percent of Republicans, 74 percent of Democrats and only 68 percent of Independents stated satisfaction with their work-life situation.